aus "White Embossings on Gray (WEG)"
Josef Albers (Bottrop 18881976 New Haven, Connecticut), explored the artistic dimension of colour and the relationship of colours to each other. Around 1950, he found the ideal form for colour in the square. Following his academic training in Berlin, Essen and Munich, he began studying at the Bauhaus in Weimar in 1920 and took on a teaching position there in 1923. In 1932, when Mies van der Rohe was named head of the Bauhaus, Albers became his deputy. When the Bauhaus was closed by the National Socialists in 1933, he was appointed to the Black Mountain College in Ashville, North Carolina and moved to the USA with his wife, the famous Bauhaus weaver Anni Albers. The move to the United States marked the beginning of a new period in the artists career. Albers experimented with the interaction of colours, forms, lines and surfaces and found in colour a comprehensive artistic means that was capable of expressing everything. 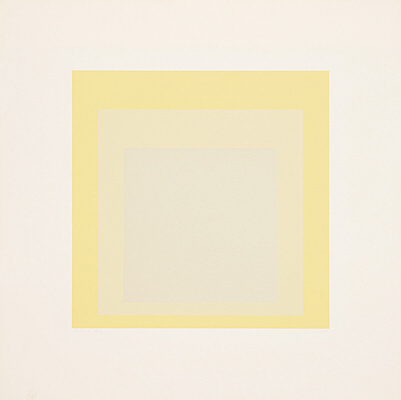 His famous series Homage to the Square was the result of his reflections on theories of perception, which Albers formulated in numerous writings and interviews. The individual works from this series consist of ostensibly superimposed squares of different colours and colour nuances. Here, Albers deals with the interaction of the colours with each other, which can infinitely change their effect through mere juxtaposition. 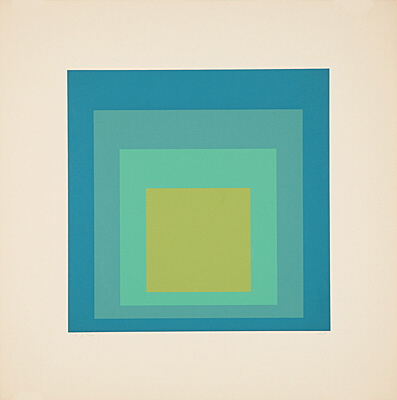 In his work, Albers was both a painter and a philosopher of colours. As a teacher as well as an artist, he was ground-breaking for an entire generation of American artists. Op Art, Kinetic Art, Colour Field Painting, New Abstraction and Minimal Art were all influenced by his work.